Sequins are a fab option for adding vibrant colours if you do not want to use giltter or adhesive gems to embellish your crafty creations. We have created 3 different ideas for you to enjoy using the new Dovecraft Bohemian collection. 1. Cut a 15cm square from the 12 x 12 paper pad and stick to the 6 x6 white card blank. 2. Add two layers of foam to the edges of the card to create a border around the outside edge. Make sure there are no gaps. 3. Sprinkle a few sequins into the centre. With the A4 acetate sheet cut a 15cm square and stick onto the foam borders to create a shaker. Add one layer of foam tape on top of the acetate to add further depth to your card. TIP: add a bit of talcum powder to the inner edge of the foam tape to stop the sequins from sticking. 4. We have then used the die cut front cover of the Bohemian paper pad to layer on top of the acetate. Remove the excess paper so it fits the size of the card and stick to the foam tape. 5. To embellish the card, cut some of the butterflies from the pad and stick to the card using double sided tape. We have used a mixture of butterflies from the glitter and gloss effect pages. 6. 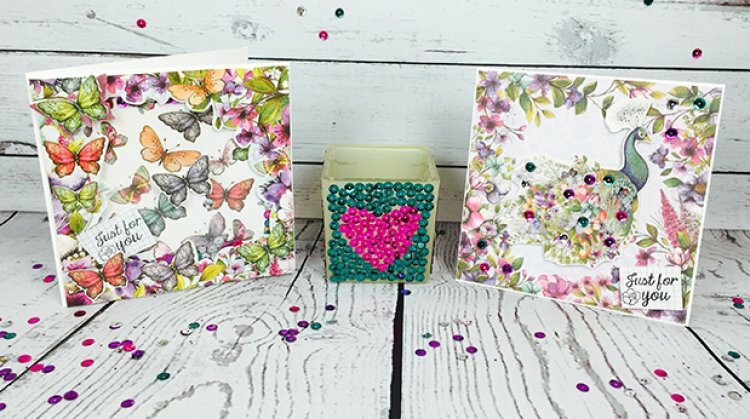 We have also created butterfly toppers and added to the two corners of the card. To make, stick a card butterfly to the card using a small strip of foam tape. Cut a small butterfly from the paper pad and layer onto of the card butterfly with double sided tape. 7. Stamp the Just for you sentiment stamp on a piece of the backing paper, cut to size and stick to the corner of the card tucking it into the border. 1. Add some clear drying acrylic glue to a piece of scrap paper. TIP: We recommend that you use a pair of tweezers to easily pick up your sequins and prevent your fingers getting sticky. 2. Using the tweezers, pick up your sequins and dab a bit of glue onto the back and place onto the glass candleholder. 4. For the side of the candle holder, we have created a multi-coloured scattered sequin design using the Bohemian sequin pack. Fancy creating a few other designs? Why not try chevrons, stripes, butterflies, flowers or monograms for decorating your candle holders. 1. Cut a peacock from the Dovecraft Bohemian 12 x 12 paper pad and stick some sequins to the peacock to add some sparkle and leave to dry. 2. With the 6 x 6 paper pad, cut a 15cm square of paper and stick to the card blank. We have used the floral border paper to create a frame for the peacock centre piece. 3. Using 3D foam pads, stick the peacock securely to the centre of the card. 4. Stamp the Just for you sentiment stamp onto the backing paper and cut to size. Add to the corner of the card, using 3D foam pads. 5. As a pretty finishing touch, we have a set of 3 sequins to the top right and bottom left corner. What interesting projects have you made with sequins? Let us know below. We would love to see them in our project gallery.